Thinnings, or intermediate treatments, can improve the health, safety, and productivity of conifer plantations and natural stands. In our new video, Minnesota DNR forester Art Widerstrom and discusses and how to plan your thinning, where to find help, and how to get it done. Be sure to leave your comments below. If you like this video, you may also be interested in a recent video by Dovetail Partners from a 2009 field tour on intermediate treatments in Aitkin County, MN. 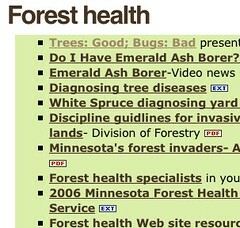 Just a quick post in case you missed it: The Minnesota DNR, Division of Forestry has published the June 2009 Forest Insect & Disease Newsletter (PDF). This is by far the best source of timely, quality information on insect and disease issues in the Minnesota woods. This summer’s issue includes a play-by-play of the discovery of emerald ash borer in the Twin Cities this spring. The list of articles from the June 2009 issue is below. The Minnesota DNR, Utilization and Marketing unit has released the spring 2009 edition of the MarketPlace Bulletin. The main focus of this issue is the arrival of the emerald ash borer in Wisconsin, just one mile from the Minnesota border. To learn more about this discovery, peruse the numerous ads, or check DNR auction dates, click on the file below. Friday, April 24 marks the beginning of an entire month of celebrating trees. For Arbor Month 2009, the Minnesota Department of Natural Resources is asking you to share a photo, drawing, or story about your favorite tree. Get involved: share your favorite tree! Go outside to take a picture, make a drawing, or tell the story of your favorite tree, then post it here. State champions needed for Minnesota’s big tree registry! While you’re at it, the DNR is also looking for state champion trees of the following species. Learn more or submit your champion trees at the DNR’s Big Tree Registry. Just to let you know we have posted several pieces on the web for your reference. 1. The Division Invasive Species guidelines are listed on the Forest Health page. 2. You’ll also find there the SFI Minnesota Invaders brochure, a nice general publication for your clients. 3. On the right of the Forest Health page, you can also find a link to logger information. It brings you to the timber brochure on invasive species. You can print the complete brochure by clicking “complete brochure” on the bottom of the picture to the right. On the brochure, are links back to the Invasive Species guidelines and to my email if you have any questions. 4. Note that on the Forest Health page, you can find information on some exotic insects and diseases and on the Division of Ecological Resources website you can find info on exotic plants. 5. One other reference not on our website, but elsewhere is a publication put out by IATP on invasive plants in Minnesota. 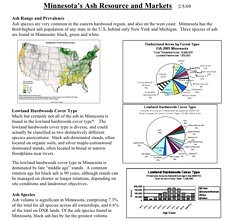 Keith Jacobson of the Minnesota DNR – Forestry Utilization & Marketing unit has just updated his brief overview of Minnesota’s ash resource and markets. This just came out by email today, and is dated February 2009. Download a PDF copy here. The Minnesota DNR, Division of Forestry has just released the Winter 2008 issue of their excellent Marketplace Newsletter. The current issue includes articles about the economic situation and it’s relationship to wood product markets; average stumpage prices by species; trends in woodland certification; a great list of classified ads; and much more. Both the current issue and back issues are available here.